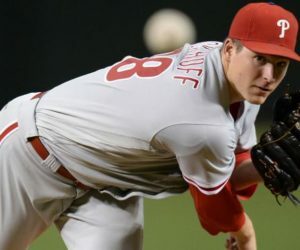 PHILLIES A LOCK TO IMPROVE ON 80-82 AFTER PRODUCTIVE OFFSEASON! 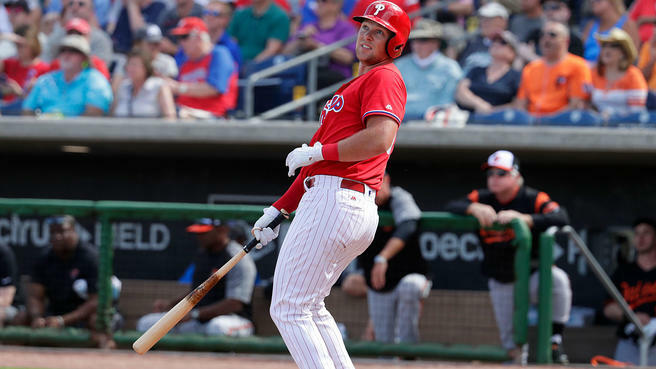 The Phillies officially open spring training today after an offseason that has seen trades and free agent signings that will help them improve from last year’s 80-82 record. They improved their woeful defense with their first deal, acquiring SS Jean Segura and relief options James Pazos and Juan Nicasio from the Mariners in exchange for 1B Carlos Santana and SS J.P. Crawford. This heralded the end of the ill-fated Rhys Hoskins (above) in the outfield era, moving him to Santana’s old spot. Then they improved their bullpen, adding David Robertson from the free agent market, and lefty Jose Alvarez in a trade with the Angels that cost them righty Luis Garcia. Robertson has quietly been one of the most consistent relievers in baseball; 10 straight years with better than league average ERA, 10 Ks per 9 innings and less than a hit allowed per inning doesn’t grow on trees. Andrew McCutchen was signed to a three-year deal. He’ll likely play RF, where he projects as at least an average defender. His bat will play better than it did in San Francisco, where he spent the bulk of last season. He could be utilized in a number of ways in the batting order, as he retains OBP skills and pull-side power. The All Star version of McCutchen is likely gone forever, however. Last week, the Phils made their other big everyday player acquisition, obtaining J.T. Realmuto from the Marlins in exchange for catcher Jorge Alfaro, righty pitching prospect Sixto Sanchez and lefty pitching prospect Will Stewart. Realmuto is the rare 130 to 140-game catching option. Bryce Harper and Manny Machado are the two dominoes yet to fall who will impact a number of clubs with their decisions. The Phils are likely the favorites to land Harper, though their odds of success are only about even money. They’re likely his default option; he’s shopping around to either find a superior offer of a comparable term, or a short-term place to land with a huge per year pay rate and awesome quality of living on and off the field. Every day that goes by without finding either of those scenarios makes the Phils bigger favorites. Look for a decision this week. If Harper comes to Philly, Nick Williams goes to the bench. If he doesn’t, the Phils will turn their eyes to Machado, whose arrival would displace Maikel Franco and keep Williams in the lineup. If they sign neither? They would then likely turn their attention to the top of the remaining starting pitcher market, with Dallas Keuchel the top prize and Gio Gonzalez leading the next tier. Mike Moustakas is still out there, and has been rumored to be connected to the Brewers, Padres and others. Not sure he would constitute a large enough upgrade over incumbent starter Franco and multi-positional option Scott Kingery. 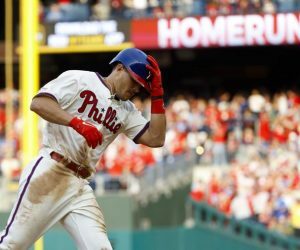 The NL East race figures to be a barn-burner, with each major and some minor transactions potentially buying the win or wins needed to put a team over the top. That’s why the Segura and Realmuto trades, in particular, were so important. Both were multiple win upgrades. That’s why the Harper/Machado situations matter as well. Not only are they great players, with their prime years up for grabs, they both represent multiple win upgrades at their respective positions. An 88-win NL East team might stay home; a 94-win one could win it all. The Phils are one move away from being in the drivers’ seat to be in the latter group. 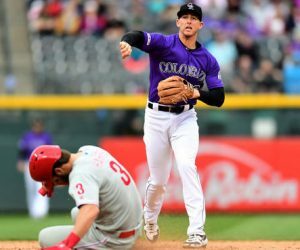 Best-Case Scenario: They sign Harper, and a league-average team defense (or close to it) enables an already strong starting rotation featuring Cy Young contender Aaron Nola, Jake Arrieta and breakthrough candidate Nick Pivetta to post even better numbers, propelling the club into the postseason, where they’d have a puncher’s chance to go all the way. Worst-Case Scenario: No Harper or Machado, the offense doesn’t click (there will be an awful lot of weak fly balls hit by the Phils’ holdover regulars), and the club gets caught in the back half of the four-team logjam at the top of the NL East. Previous SIXERS JOJO HAS HIS WAY WITH AL HORFORD, WATCH!